In part I of this post, I discussed the tough economic situation the city of Flint, Michigan finds itself in, and the role the growing role of the Genesee County Land Bank. But while in Flint, my focus was more on what the Land Bank's planning staff does, not on how the parcel acquisition process works. I spent part of the day with planners Christina Kelly and Jeff Burdick, visiting two Flint neighborhoods. Our first stop was the Thread Lake neighborhood. Kelly and Burdick have been working closely with the local neighborhood association, headed up by Barbara Griffith-Wilson. Thread Lake is one of 28 "clean and green" neighborhoods, which qualifies it for attention -- and resources -- from the Land Bank. Clean and green neighborhoods are required to maintain at least twenty Land Bank properties, and implement at least two gardening projects. In return, they have access to Land Bank financial and technical support. 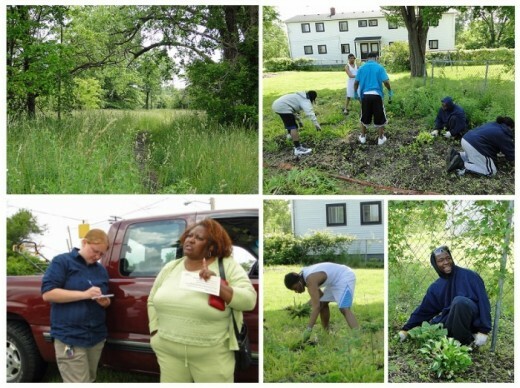 In fact, while I was visiting Thread Lake, Roxanne Adair, the Land Bank's Urban Food Gardening Coordinator, stopped by to find out what kind of vegetables the neighborhood was most interested in having planted. Several high school students are earning money helping with community gardens; they'll also be clearing a large vacant lot (above left) across the street from where they're planting. Lower left, Barbara Griffith-Wilson lists some of the garden needs to the Land Bank's Roxanne Adair. As we walked through the neighborhood, Kelly and Burdick explained some of the Land Bank's programs. One involves "side lots." Homeowners with vacant Land Bank property adjacent to the side of their home have the opportunity to purchase that property as a side yard. The cost is typically under $75. There are at least three benefits from the program. First, it brings properties back onto the tax roll. Second, it eliminates the public cost that would otherwise have gone into maintaining the vacant land. Third, it benefits the homeowners by allowing them to take control of what has often become an eyesore next to their home; unkempt vacant land can significantly reduce their own property's value. Note: the Land Bank also operates a related program allowing for residents and businesses to "adopt" a Land Bank owned lot, and then be given priority for purchasing it. Village Shores apartments in Flint. There's evidence that Thread Lake is stabilizing. 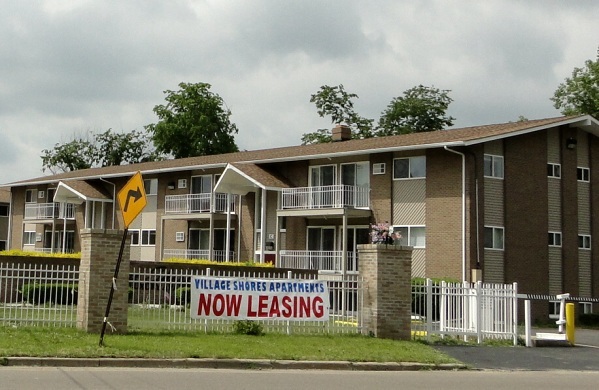 One hopeful sign is that a local developer, Charles Young, has purchased and rehabbed an abandoned housing complex, Village Shores. 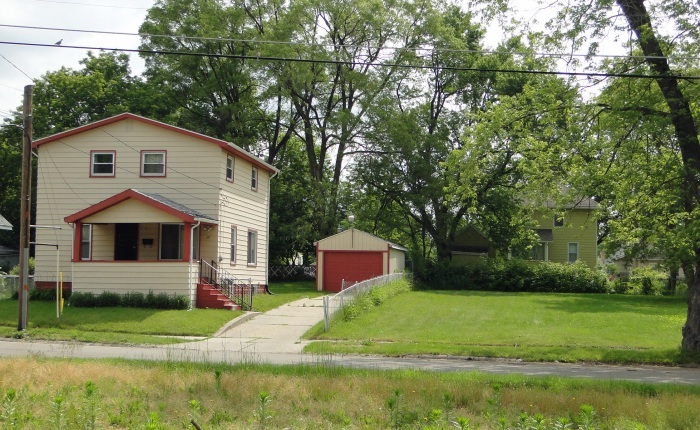 Not far from the Thread Lake neighborhood, and close to downtown, is the Grand Traverse neighborhood, another area Land Bank planners have been assisting. For the Land Bank it's one of their "strategic reinvestment areas." 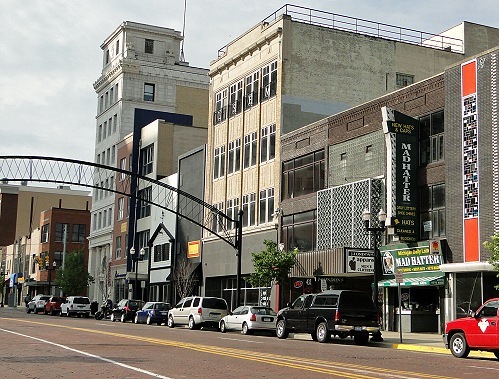 Among the positive factors for the Land Bank: the neighborhood is close to downtown; it has a strong neighborhood association; Habitat for Humanity is active there; and the Land Bank already owns considerable property in the neighborhood. One other more fortuitous factor: Genesee County transportation planner Heidi Phaneuf moved into the neighborhood in 2000, and has been active in the neighborhood association and is now its president. Working with the Land Bank, the Grand Traverse neighborhood association (which has about sixty members) has put together a strategic plan. It set five goals, Phaneuf told me: increase home ownership; improve housing conditions; improve neighborhood recreational areas; build partnerships with nearby businesses; and build the neighborhood association's capacity as an organization. 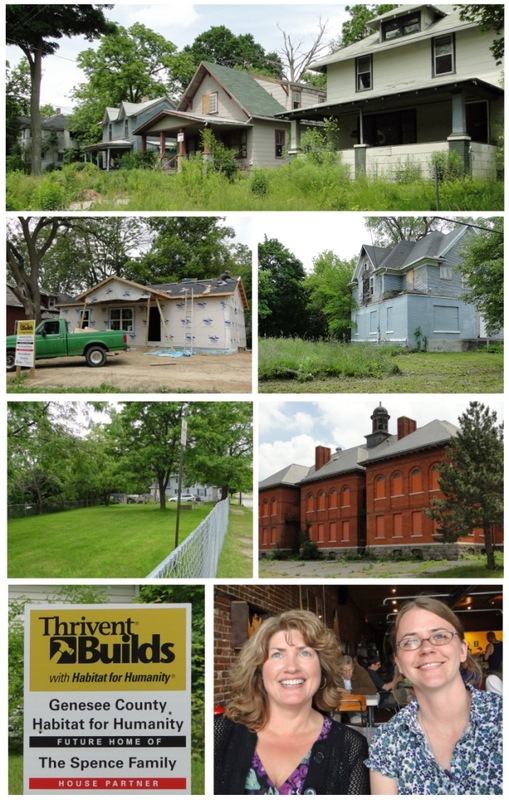 From top, clockwise: the neighborhood some blocks with considerable abandoned housing; vacant house owned by the Land Bank; former school also owned by the Land Bank; Habitat for Humanity's Margaret Kato (left) and neighborhood association president Heidi Phaneuf; one of several Habitat signs dotting the neighborhood; lot acquired by homeowner through the Land Bank; and Habitat house under construction. Playscape constructed in a neighborhood park in Flint. 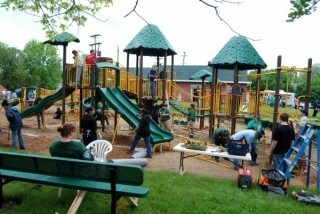 This May, neighborhood residents helped install a playscape in the local park (see photo, provided by Heidi Phaneuf). Progress has also been made towards cleaning up Spring Grove a brownfield site, where the illegal dumping used to occur. The site has a natural spring and is part of a wetland restoration and nature park development project. Habitat for Humanity has also taken a strong interest in the neighborhood. Margaret Kato, Habitat's county director told me that seven new Habitat homes will be completed by the end of the year. As Kato explained, "it was important to us that there was a plan for the neighborhood, and that the neighborhood association was welcoming and wanted to see infill housing." Moreover, Habitat has found there's "more impact to have a concentration of homes than scattered sites throughout the county." My visit to Flint -- and earlier this Spring to Scranton and Wilkes-Barre -- also makes me wonder about the declining capacity of city planning departments. There's no city planner working for the City of Flint, a city of 117,000. Instead, the Land Bank has (at least in part) taken on the role of local planners. In Scranton &amp;amp; Wilkes-Barre it's the staff at the Chambers of Commerce who have, in various ways, done the work of city planners. Photo above: downtown Flint is compact, and still largely "in business." 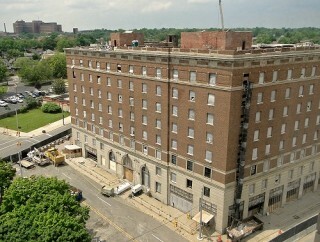 On right: the former Durant Hotel, which has sat vacant for many years, is now being converted into 93 apartments, thanks to work from the Land Bank, the Mott Foundation, and other area organizations. Christina Kelly probably best summed up the situation: "planning in cities like Flint is always first to go." But at least in places like Flint and Scranton/Wilkes-Barre, other organizations have stepped into the vacuum. While Flint has received lots of negative attention in the media -- in some ways becoming the poster boy of urban disintegration -- what's also clear is that there are many who are not giving up on Flint.